When trying to pair chicken and fruit, one of the first combination that comes to mind is citrus fruit. I could not made up my mind which citrus to pick, so I decided to do both oranges and lemon and created Roasted Chicken with Blood Oranges and Meyer Lemons. When preparing chicken you always have to make sure the meat stays juicy; chicken when overcooked dries out and looses all its charms. My 2 go-to preparations are to soak the chicken in salty water overnight, to brine the chicken, and the other option is to leave the skin on. The skin is fattier and basically a way to baste the chicken during roasting or baking. This recipe makes use of both techniques, just to secure optimal moist and flavorful chicken meat. There is of course the alternative to not cook the chicken too long … haha how come I never thought of that. I know how popular chicken breast recipes are, but every now and then you need to step off that path and try another part of the chicken. 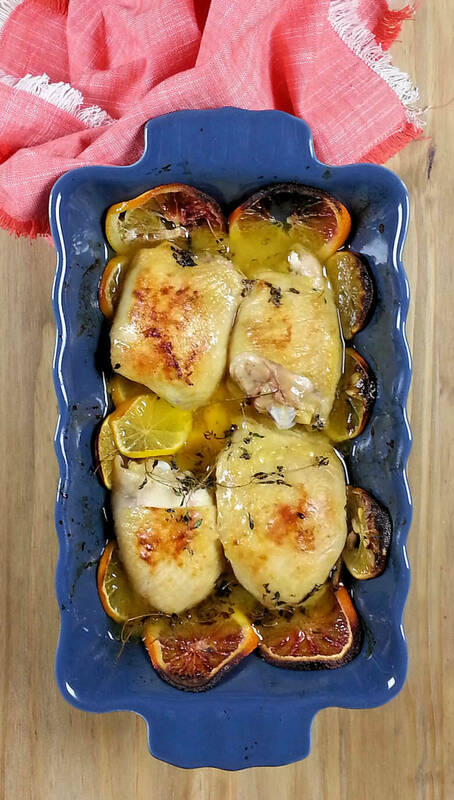 This recipe Roasted Chicken with Blood Oranges and Meyer Lemons call for chicken thighs with skin. We’ll start with brining the chicken by placing the chicken in salty water. Best is do keep the chicken in that water overnight, but if you are in a hurry, leave it in the salty water for at least 30 minutes. Remove the chicken from the brine, rinse them with cold water and pat them dry with paper kitchen towels. Prepare the pan by placing slices of blood orange and Meyer lemon, alternately on the bottom of the dish, place the chicken thighs on top, skin side up. Then pour a mixture of blood orange juice and white wine over the chicken and cook/roast the dish in the oven (325 degrees) for approx. 55-60 minutes, or until a thermometer inserted in the thick part read 160-170 degrees F. Then I would place the dish under a broiler on high to create a browner and crispier chicken thigh. Keep an eye on this, you don’t want to burn the chicken. Fill a bowl with 1 quart of lukewarm water and add 1/4 cup of kosher salt. Stir to dissolve the salt and add the chicken thighs. Allow them soak up the salty water for at least 30 minutes, but preferable overnight. Remove the chicken from the brine, rinse them with cold water and pat them dry with paper kitchen towels. Cut 1.5 blood oranges and 2 Meyer lemons in thin slices and cover the bottom of a baking dish with these slices, alternate them. Place the chicken thighs on top of the citrus slices, skin side up, make sure they don't overlap each other. 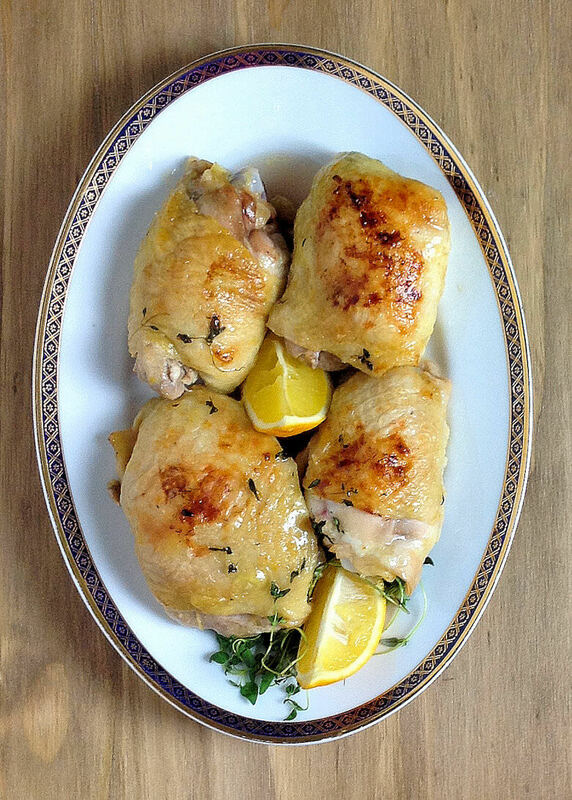 Place a few slice of lemon between the chicken thighs. Squeeze half a blood orange (about 1/4 cup) and mix it with the white wine. Pour this mixture over the chicken thighs. Roast the dish in the oven for approx. 55-60 minutes, or until a thermometer inserted in the thick part read 160-170 degrees F.
If you want the chicken to be a little browner and crispier, turn on the broiler on high and place the dish for approx. 5 minutes. Allow the chicken to rest for a few minutes before you serve them.